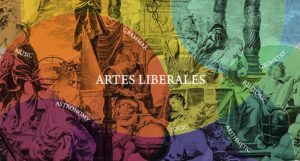 From 7 February through 18 April 2019, the UCU Humanities Faculty will host the Artes Liberales Academy for students of the 9th through 11th grades. The academy allows students to develop study and research skills in a university environment. It prepares them for higher education and helps them find and clarify their own interests in the humanities, with a view to becoming successful university students. Natalia Kovalchuk, head of the Artes Liberales bachelor’s degree program, explained in detail. – Tell us about the specifics of the academy. What opportunities does it offer high school students? – Our main goal is to show high school students the difference between university and high school studies, and, in this way, to give them an opportunity to see themselves in the role of university students. The difference between a university and a high school is obvious and felt. We realize that, for many high school graduates, even strong entrants, it is sometimes difficult to re-orient themselves from the educational model to which they’re accustomed to what happens at a university. First of all, this involves more independence in acquiring knowledge and experience, compared to simply receiving information from teachers. We offer very specific skills, which not only help one get used to university life but give the instruments for professional growth in the humanities. – What specific skills do you have in mind? – It’s important to emphasize that we are open not only to those interested in specialized fields in the humanities but to high school students who, in principle, are widely interested in the humanities: literature, history, or language study. On the other hand, we also offer knowledge and skills with a practical dimension – like rhetoric in the wide sense, that is, the ability to express one’s thoughts, orally and in writing. There are also skills connected with the analysis and creation of a scholarly text. Of course, at the high school level, requirements are not the same as for college students. We try to teach the participants of our academy how, with independence and quality, to create various types of texts. It is important to combat unhealthy practices which the students bring from school, like reports that they simply copy or take from the Internet. So one of the main tasks of the academy is to lead students to independent thinking and creativity. – How did the idea of creating the academy arise at UCU? Are there analogues at European or American universities? 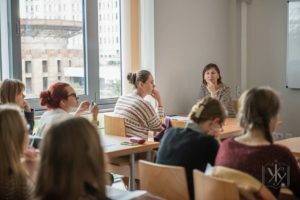 – The idea of this kind of educational project comes from the experience of working with first-year students at the university. Analyzing what preparation was truly useful for them, we understood that it is worth accenting on universal experience that the future university student will need during studies and beyond. We need to work with potential university students until they enter university. UCU earlier had a program for high school students, English Week. It was fairly successful and offered participants interaction and study in an English-language environment. The academy’s program also has an English club which concentrates more on communication than on studying grammar or vocabulary. Universities, in particular national ones, have so-called “minor academies,” that is, scholarly associations for high school students. This is similar to our project, for we also encourage high schoolers to independent, creative research. An approach like this allows one to determine one’s scholarly interests in the humanities: culture studies, philology, or history. We show which themes are today relevant and interesting. So, as to analogues, my answer is twofold: yes and no. Certain elements of the educational process are common at other universities and at UCU. However, I would venture to say that the project of our academy is a new project, and even unique in its Ukrainian realities. – Describe the instructional process. – Starting on 7 February, participants of the academy will have two-hour lessons composed of two parts. The first hour is dedicated to the basics of rhetoric, critical thinking, and writing a scholarly text. The second part is lectures-presentations by our teachers. They cover various themes in culture studies, history, and philology. For example, we acquaint the participants with “digital” humanities. Our philologists describe new technologies in developing dictionaries and translation programs. Historians describe digital mapmaking, that is, how the map of a modern city can be seen through the prism of various historical epochs. Culture studies experts describe intercultural cooperation, classical, historical, or literary narratives which are used in today’s culture, for example, online games, films, etc. Lectures will be given at the expert level but, in order to make them truly attractive to teenagers, we need to show that important themes are at the same time interesting for research and discussion. – Who is your target audience and do you plan to regularly offer the academy? – We are now considering the spring session as a pilot project. If it is successful, we will repeat and perfect it. Right now, in connection with the fact that these lessons will be offered on work days, we are planning on students from Lviv high schools. But, potentially, we are also planning sessions on weekends for high school students from other cities and regions of Ukraine. In general, our target audience is high school students interested in the humanities and our potential students. For 11th-grade students, we have a particular proposal: if they take part in the majority of lessons and prepare a project under the direction of one of our teachers, they will automatically be a finalist in competition for scholarships. This, correspondingly, will increase their chances not only to become an UCU student but to receive an UCU scholarship.